Amazing. 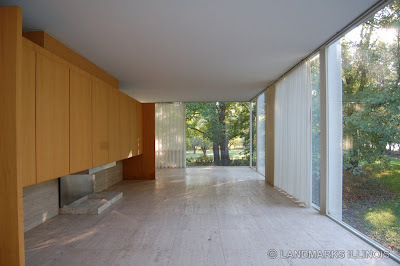 The Farnsworth House with all the furniture and the teak wardrobe at the east end removed. 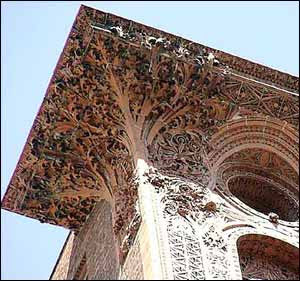 The wardrobe was taken away for restoration after the flood. 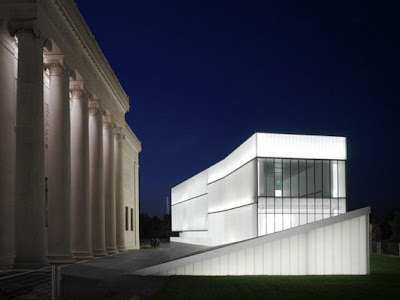 We get a chance to see Miesian space flow in new ways. 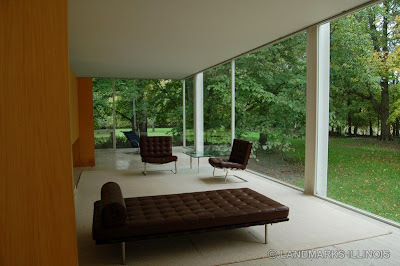 I think Mies didn’t want that cabinetry there, his client Edith Farnsworth convinced him she needed it. Photos courtesy of Whitney French and Landmarks Illinois. Every historic house should have site manager who is such a good photographer! Three more photographs here. And you’ll find out how to visit the house, and/or help pay for restoration. 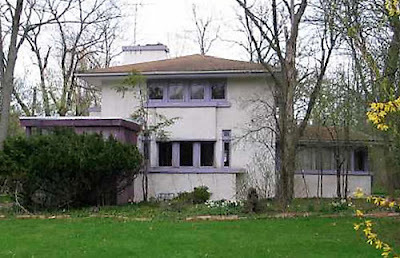 Will we lose another Frank Lloyd Wright house? When I was a kid, following the assassinations of Bobby Kennedy, Martin Luther King and John Kennedy, and in the tumult that followed, I felt unsettled. I used to walk up to the Ravine Bluffs development designed by Frank Lloyd Wright, to see the houses there. They seemed so comfortable where they stood. They seemed a part of the land, a natural outcropping of the place. I used to just stand there and look at them and find peace. Now, one of Wright’s Ravine Bluffs houses is in danger. Current Condition and/or Status: The house has been vacant for two years and has fallen into disrepair. Last winter, the heating pipes burst which has caused further damage. Potential Threat: The property is for sale and is being marketed for the house “as is” or the land, which is less than a quarter-acre site. If torn down, it would be the first intact Wright house to be demolished in the United States in over 30 years. What You Can Do: Click here. Someone would tear this beauty down? We’ve got to find a way to save it. 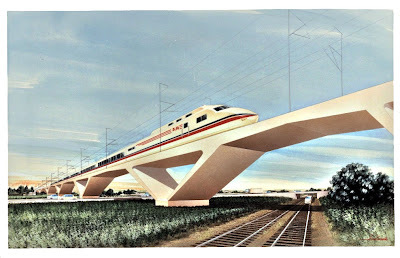 Frank Lloyd Wright is perhaps the greatest artist America has ever produced, in any medium. Up there with Louis Armstrong and Walt Whitman and Martha Graham. A creator of beautiful worlds. Find a way to save it. Well-being depends on it. The Spiral Jetty of Architecture? Hang it all. 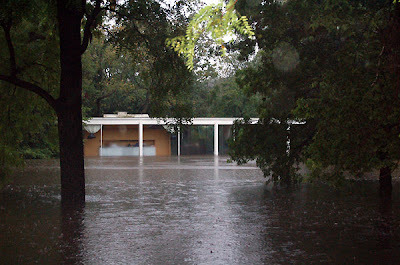 Mies van der Rohe’s Farnsworth House in Plano, Illinois has flooded – again. 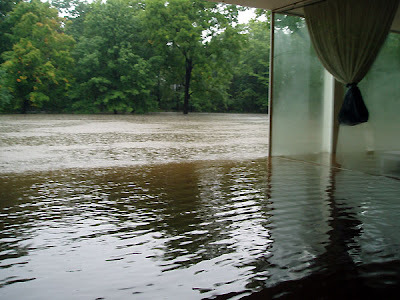 Tropical Storm Lowell and Hurricane Ike are behind rains pummeling the Midwest. The National Trust for Historic Preservation has the story. Support the Trust’s house rescue efforts here. Landmarks Illinois says the house is closed for tours for the rest of the year. You can help them here. The Chicago ex-urbs around the Farnsworth, fields when it was built, are now very built-up, without enough land left for rainwater to seep into the earth. 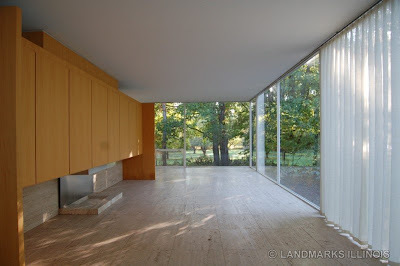 Combine that with climate change and- in the 60 years since the Farnsworth House was built, it has suffered 7 one hundred year floods. Is it becoming the Spiral Jetty of architecture? The water has receded to a height of about 4 and a half feet with the expectation that the majority of the site will be drained by late Wednesday or early Thursday. We are working to get restorationists into the house (via boat) to assess the damage and advise on next steps. The furniture was spared with the exception of the wardrobe. The core took a bit of a hit, but we are optimistic that the appropriate drying technique can spare us some heartache. You are currently browsing the archives for the Landmarks Illinois category.